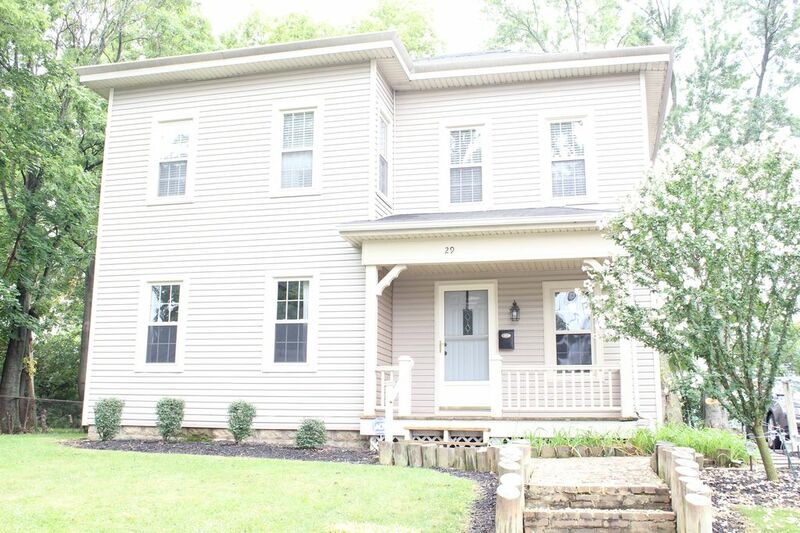 Our house is a spacious 4 bedroom, 3 bath conveniently located in Old North Columbus on the cusp of the University District near both Route 315 and I-71. Walking distance to High Street and The Ohio State University Campus and a quick trip to the following: Ohio Stadium (1 mile), Mapfre Stadium (1 mile), Ohio Fairgrounds/Expo Center (1.3 miles), Greater Columbus Convention Center (2.9 miles), Nationwide Arena (3.1 miles), Easton Town Center (5.6 miles), Polaris Fashion Place (9.2) and much more. The house can easily accommodate both small and large groups. On the second floor are three (3) bedrooms and two (2) full bathrooms. The first bedroom has a double bed. The second bedroom has two (2) sets of full over full bunkbeds (4 full beds in total). The third bedroom has a queen bed, as well as a pack n play. Each bedroom has a chest of drawers and plenty of closet space. • Refrigerator/freezer, microwave, & electric stove/oven, just about anything you need in a kitchen! • Outdoor areas include a private fenced-in backyard, a covered rear porch with seating area, and a covered front porch. • Private off street parking for up to 8 cars is available behind the house with room for additional on street parking in front of the house on Tompkins. Check-in is after 3 PM. You are able to access the entire place. We are hands-off hosts but are available as needed via email, phone, or text. We know our neighborhood very well and care about our community- let us know when you need something or have questions! We also provide lots of recommendations for things to do- everything from museums and outdoor activities to social activities, nightlife, shopping, etc. Housekeeping service is per stay, not per night. There is no handicap access. Guests with allergies and related medical issues and/or sensitivities- cleanliness is one of our top priorities however we are unable to 100% guarantee that the house is free of pet dander, cigarette smoke, air fresheners/cleaning product scents, and any other elements that may trigger a medical problem or sensitivity. Also note that we cannot issue refunds due to the reasons above. Hello! My name is Matthew Stierhoff and I am a graduate of the Ohio State University where I served as Brutus Buckeye from 2012-2015. I currently reside in Columbus and work for the Huntington National Bank. Located close to campus, this college house turned vacation home has served as the retreat for three family members and friends attending the Ohio State University. With everyone having successfully completed their degrees, we decided to hold on to the property and allow others to enjoy it and Columbus as much as we have. The house provides the best of both worlds as you are able to close to campus for game days and events without having the noise and hassle associated with the mess. This home was perfect for our stay! They have provided you with everythig you could possibly need, the home was spotless, cute, and very comfortable! Perfect place for a gathering! The house is beautiful and perfect if you want to be close to campus and/or downtown. We had 10 of us stay comfortably and the owner, Matt, was very helpful and responsive. Thank you!! Perfect home for large groups and families, beautifully decorated and very clean and accommodating. The house has a fantastic layout. Privacy yet lots of shareable spaces. Impeccably clean and decorated wonderfully. Feels like home. Location is perfect-close to everything you want to do. Safe neighborhood. Owners are kind and more than accommodating. Would definitely recommend highly. House nicely decorated plenty of everything you could need in house. Close to downtown and resturaunt great parking. Updates throughout whole house. Owner very responsive and easy to contact. Will definitely rent again next family gathering. My 4 adult children and the grandchildren gathered for a reunion and to see my youngest son play football ..... GO BUCKEYES ! We all enjoyed our time together. The house was perfect and nothing was spared. Games for inside and out and a warming fire for smores and to ‘talk story’. We all walked to the stadium and visited local establishments during the evening. I recommend this home to anyone visiting Columbus! Thank you Matthew! Great place! Clean, has everything you need. Great location. Comfortable for multiple families or large groups Would definitely stay here again.